This article first appeared in the Spring 2019 edition of The Institute of Leadership & Management’s Edge Magazine. It’s 1pm on a Monday and I’m stepping out for a regular one-to-one meeting with one of PensionBee’s software engineers. The opening question, “Are you happy?”, starts a conversation that is very different to the conversations I used to have with managers, revolved around performance, and opens a window onto my colleague’s thoughts and feelings and how their time working in the company fits into their life. Our vision is to live in a world where everyone has a happy retirement, and to do this we need to make pensions simple and engaging. Pensions are not something that most people typically take an active interest in, despite the financial importance of pensions – they are often someone’s largest financial asset after their property. Pensions are typically dull, complex and provided by companies that are frustrating to deal with. The resulting disengagement means people are not actively choosing their pension provider, and when consumers don’t exercise choice there is less pressure on customer service, price and product, so they generally get a worse outcome – not exactly a recipe for a happy relationship with one of your most important financial products. At PensionBee, I’m fortunate to be a part of a team who get out of bed every day motivated to solve this problem and help the workers of the UK take control of their long-term savings. One of our challenges is how to create an environment where everyone in the team is able and motivated to use their skills and work effectively together. To do this, we put happiness at the heart of team culture and use it as a lens for how we see our people. We believe that a happy team will lead to happy customers and happy customers will reflect back on the team in a virtuous cycle. This means that happiness, or “Happiness!” as we call the programme, is a target that guides rather than follows more traditional people management techniques such as performance management. This seemingly unusual approach is something that we’ve come to see as a competitive advantage, leading to better workplace fit, better performance, and ultimately, more satisfied customers. In this article, I will share a few stories of what it means for PensionBee to build a culture around “Happiness!”, and how we create an environment for it to flourish. Every new joiner to PensionBee is assigned a Happiness! Manager, who is tasked with meeting with them regularly and discussing their happiness levels. A Happiness! Manager can be different from the person taking responsibility for developing someone’s performance, as we want to make it clear that Happiness! Managers’ priority is happiness. The meetings take place every six-eight weeks and, although the conversation is deliberately open-ended, the meetings start with the simple question, “Are you happy?”. The aim is to focus on how someone is feeling, especially relative to the previous meeting, and what the company can do for them to better support their growth. Steering the conversation to look at someone’s performance is inconsistent with this, as that is instead asking what they are doing for the company. Happiness! meetings cover a variety of topics – you might talk about adjusting someone’s working hours to give them more time with their children, how their aspirations are changing and what this means for their role, or an idea they have for improving the workplace environment. Sometimes the conversations are just a check-in that shows that someone cares and is there if they are needed. Happiness! meetings create a default of openness and honesty, which transfers well into people’s work and interactions with their teammates – if you feel comfortable to discuss any topic you are more likely to give honest feedback or collaborate across teams, all of which adds to overall productivity. Culture in any workplace is just another word for behaviour - it’s inevitable that there will be a culture in your company, so it’s better to design it deliberately. We want the principle of Happiness! to drive group behaviour, alongside the company’s values of Simplicity, Honesty, Quality, Innovation, and Love. We use rituals to define and habitualise behaviours we believe are important. An effective method for communicating a message is to repeat it over and over again, and rituals are the behavioural equivalent. To give an example, there is a daily “stand-up” each morning at 9:15am that the whole company participates in – we stand in a circle and set out our intention for the day, and flag if there’s anything we need help with. It’s a great way of keeping everyone connected to what others are doing and keep a spotlight on the whole team’s effect on customers. In a similar vein is the bi-weekly Show ‘n’ Tell, where anyone can present on something they have done in the last two weeks they are proud of. Questions and feedback are encouraged, and the sessions are often used to celebrate team performance or show upcoming product changes. We regularly receive feedback that these rituals show the team that we genuinely value transparency, and that we want them to feel like they can input across team boundaries, all of which increases job satisfaction. Another contributor to happiness is the connection between your actions and your effect on customers. Customer feedback – both positive and negative – is highly visible in a channel on Slack, a messaging tool that everyone in the team uses. PensionBee customers are assigned a personal account manager from the Customer Success team when they sign up, who they know as their “BeeKeeper”, and feedback often mentions these individuals, which is fantastic for creating that feeling of a job well done. What has been even more interesting to see is the response to negative feedback, usually triggered by a customer who feels like we have dropped the ball or failed to communicate regularly and clearly. As soon as negative feedback pops up in Slack, this lights a fire under the whole team to sort it out, and a multi-disciplinary group naturally forms to address the issue. This will usually include the customer’s BeeKeeper, someone from the product team who can help fix the problem, someone in the marketing team who will help if necessary on social media or respond to a review, and also involve compliance or technical pension experts if the issue calls for that. Initial transparency is coupled with the delegation of responsibility for tackling customer issues to the people who have the information to deal with them best, and this allows for a rapid and effective response. It is not unusual for a customer who has left negative feedback to react positively to the group’s efforts and revise a negative review or become a strong advocate for PensionBee, further increasing the happiness felt by the people involved. The above example is enabled by embedded use of technology – in that case, Slack being used by all team members, and integrations with external customer feedback tools. This approach is at odds with a more traditional structure of centralising feedback through specific channels, communicating issues out in regular meetings, and eventual resolution of customer problems by specifically trained staff. We believe that by encouraging a higher level of technical literacy, we can create better outcomes for team members and customers. Technology is something that everyone is trained to work with and encouraged to think of as a mechanism for making them more productive. The media is currently hooked on the concept that AI and big data are coming to “eat all the jobs”, in the words of Marc Andreessen. For us, technology is something that is part of the reason PensionBee is able to exist at all, and we are constantly looking for ways to increase our team’s skills with technology and make sure everyone in the organisation can have high quality conversations about tech. This approach presents a challenge to the role of the software developers at PensionBee. Part of their job is to look for ways to be tool-builders, helping people with less technical experience to get the most out of technology. If people can see that technology helps them become more effective, that will encourage them to seek more opportunities to use technology. Moreover, we have supported members of the Customer Success team who want to move into software development to do so, as part of a general effort to transition and promote within the company. Having trained within the Customer Success function, people are highly experienced in customer needs and the company’s product, which makes them highly perceptive and valuable. An investment training them in technical skills means they are then able to bring this experience to a different area of the business, and the support they feel changing career path contributes directly to their happiness. It’s impossible to talk about happiness without considering the role of mental health within the modern workplace, as mental health issues are on the corporate agenda more clearly than ever before. 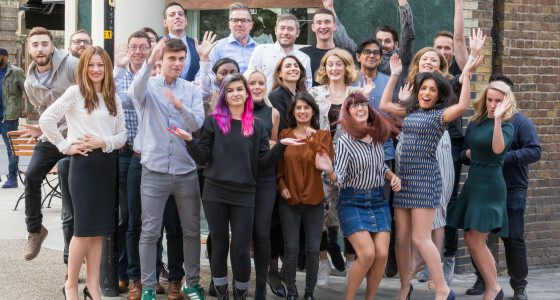 Happiness is at the heart of good mental health and a culture built around happiness ensures that the PensionBee team can adapt to changes in modern working practices and pressures. By encouraging happiness as a habit, team members are motivated, able to think freely and creatively and are a pleasure to work with – exactly the sort of foundation we need to tackle the big problems affecting the country’s long-term savers.